Metromac is a leader in providing Marine, Industrial and Electrical Instrumentation solutions. Incepted in 1985, the organization has grown in strength, expertise and experience into a premier solution provider to several clients worldwide. We help oil and gas, marine, power and utility industry clients to resolve their business challenges. Enriched by the experience and expertise of our team, and with a loyal customer base who expect us to deliver beyond expectations, we have expanded our facilities ahead of Dubai, touching Abudhabi, Qatar and Fujairah. 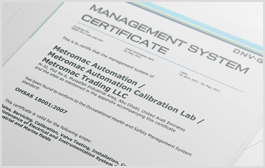 MetroMac is known for the reliable and prompt services of the highest quality, and has been awarded with ISO 9001 since 1998; we have also accrued accreditation to ISO/ IEC 17025:2005, ISO 14001 and OHSAS 18001 during this journey. Both our customers as well as our principals recognize us as a provider of quality services across the areas we operate. We pride in offering solutions leading to customer delight. A comprehensive and readily accessible maintenance history of clients, transparent and swift response by our engineers and an impeccable record in safety at work has helped further define the firm’s reputation globally. Metromac endeavours to sustain its excellence by providing best-fit product and service solutions to our growing customer base, thus contributing to continual growth of the company and its employees.